Psalm 46: Deus noster refugium et virtus. They shall not overpow’r us. Auf Erd ist nicht seins gleichen. 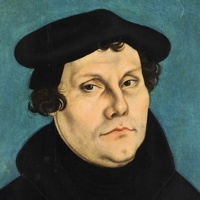 Martin Luther wrote “A Mighty Fortress Is Our God” (“Ein feste Burg ist unser Gott”) as a metrical setting of Psalm 46, though it may more accurately be said to have been loosely inspired by the Psalm. 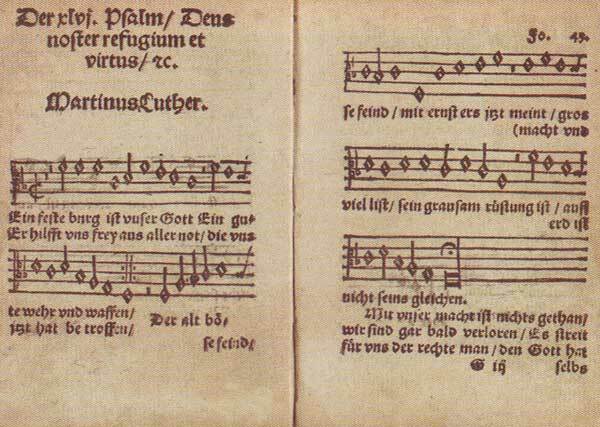 The first known appearance in print of both text and tune was in Joseph Klug’s Geistliche Lieder auffs new gebessert , Wittenberg, 1529, now lost, but reprinted in the still-extant 1531 Erfurt edition of Andreas Rauscher. “Ein feste Burg” as it appears in Joseph Klug, “Geistliche Lieder auffs new gebessert,” Wittenberg, 1533. The translation, taken from The Lutheran Hymnal , 1941, No. 262, was first produced for the 1868 Pennsylvania Lutheran Church Book, combining the translations of Thomas Carlyle and W. M. Reynolds with the first line of Frederick H. Hedge’s famous 1852 translation. The result is a text that is nearly word for word reflective of Luther’s German, while still retaining the original meter and rhyme scheme. The music is largely adapted from the 1597 five-voice setting of Johannes Eccard. The melody is in the form originally composed by Luther, with the exception of the first note of the eighth line, which has been shortened from a half to a quarter note, in keeping with the tradition inherited by the Missouri Synod. Both text and music may be freely reproduced for any purpose whatever and are offered with the prayer that they may serve for the edification of Christian people everywhere.